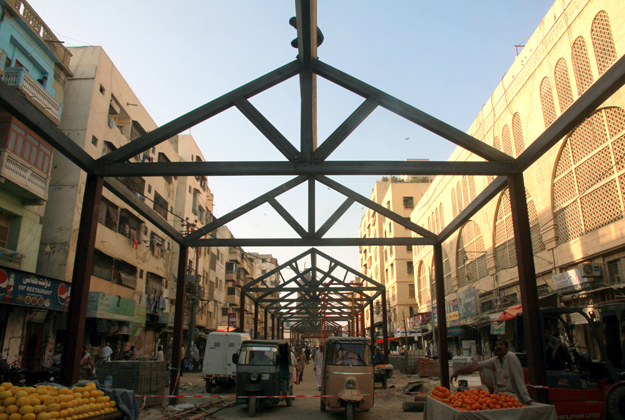 Work to convert Mir Karam Ali Khan Talpur Road into a food street will be completed in June this year as a part of the ‘Revival of Surrounding of the Empress Market and its Adjoining Areas’ project. This was stated by the chief engineer of the project. According to him, work on converting Raja Ghazanfar Ali Khan Road (Bohri Bazaar) into a night bazaar will also be completed by June. The project’s chief engineer, Navaid Izhar, also told The Express Tribune that a part of Mir Karam Ali Khan Talpur Road, formerly known as Napier Street, would be pedestrianised so that vehicles could not obstruct the view of the main entrance of Empress Market and its tower from the food street. Currently, the road has been closed for all sorts of traffic and steel structures are being erected in the middle of the road, under which kiosks of different food brands will be set up. The entire road will be paved with walkways on both sides. “Citizens will be able to enjoy the food offered by different restaurants and can spend time in Saddar, which is rich with heritage buildings,” the chief engineer said, adding that the existing shops on both sides of the road will not be affected by the project. The food street project is part of a bigger plan to overhaul the Saddar area through re-routing public transport, development of the area as a traffic-free pedestrian zone, development of art and cultural activities, and value addition to the area through food and entertainment activities. “The project aims to reduce the traffic mess in Saddar by re-routing traffic on alternative routes as decided in the master plan,” said Izhar. The project, which aimed to control traffic issues and air pollution in the heart of Karachi, was launched by former governor Dr Ishratul Ebad in March 2014. It was supposed to be completed within two years. However, it was delayed like many other projects. 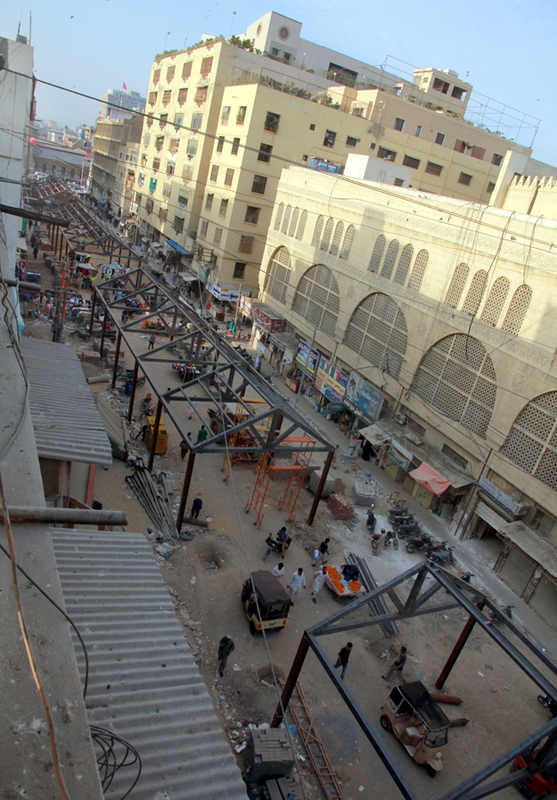 According to the project engineer, five roads in the area were to be renovated along with Empress Market and Jehangir Park. Of the five roads, three were to be pedestrianised while the other two roads were to be reconstructed, making them one-way streets. Many residents and traders are, however, unhappy with the ongoing work. The traders are complaining that their businesses have been adversely affected due to the closure of roads. “Roads are meant for traffic, not for food streets,” complained Zohaib Ali, a local resident, adding that the government was making the area a bottleneck for traffic, which would ultimately add to the commuters’ woes. According to Ali, the government needed to understand that it was adding to the traffic problem in Saddar rather than resolving it. The resident also said that 127 shopkeepers and residents had signed a declaration against the project, terming it an ‘anti-citizens project’. Muhammad Khalil, a trader who owns a teashop on one side of the road where the food street is being constructed, alleged that the government was forcing the traders to switch their businesses. Khalil also lamented that no effort was made by any government department to take the traders into confidence regarding the project. Other citizens expressed mixed opinions regarding the issue. “I am not sure whether things would get better or worse but the development work being carried out is an applaudable thing,” said Sajid Hussain, resident of a building situated on the road.